Local and European elections are taking place today and tomorrow [Thursday and Friday] in the Six and 26 Counties respectively. The elections are likely to confirm that Sinn Fein is the dominant political force on the island of Ireland and for the first time, is now equally strong in both the 26 Counties and the Six Counties. Historically, a major opinion poll taken earlier this week has shown Sinn Fein to be the most popular in the 26 County state, with 23% support. Other polls show it is running neck-and-neck with the traditional establishment parties, Fianna Fail and Fine Gael, who now appear to have a combined support of just over 40%, a historic low. In the Six Counties, where voting is already underway today, sitting MEP and former political prisoner Martina Anderson appears certain to lead the field. And if the polls are accurate, Sinn Fein looks poised to have three new MEPs in the rest of Ireland, with Lynn Boylan currently sitting at 23 per cent in Dublin, Matt Carthy at 15 per cent in Midlands-North-West and Liadh Ni Riada at 19 per cent in the South constituency. The party is also expected to multiply its support in local city and county councils across the 26 County state, where it won just 54 seats in 2009, compared to 340 for Fine Gael, 218 for Fianna Fail and 132 for Labour. Meanwhile, the 26 County Labour Party looks set to suffer a trouncing at the polls. Its predicted poor performance is a result of a deeply unpopular decision to back Fine Gael’s right-wing austerity programme, and is expected to put renewed pressure on Tanaiste Eamon Gilmore to step down. Commentators are attributing the backlash against the ruling Fine Gael-Labour coalition to the imposition of water charges as well as a sharp rise in homelessness and poverty generally. With its support at around 7%, it is being predicted that Labour could lose both its European Parliament seats and end up with none of the eleven on offer in the 26 Counties. Fianna Fail, the party most associated with the economic meltdown of 2008, is still failing to capitalise on anti-government feeling, with one poll placing them at 21 per cent support, two points behind main rivals Sinn Fein. It is struggling to retain its three seats from 2009. Meanwhile, Fine Gael remains mired in scandal as former Minister for Justice Alan Shatter continued to create a controversy despite resigning his post amid multiple scandals earlier this month. Contradicting his party’s stated policy, it emerged this week that Shatter is to receive a ‘golden handshake’ lump sum of over 70,000 euro following his departure from the Justice post, despite continuing to receive a hefty salary as a government TD. Transport Minister Leo Varadkar said it would “make sense” if the former minister waived the severance payment -- but he said he he doesn’t want to ‘kick’ his former cabinet colleague ‘when he’s down’. Hopes are higher for left-wing independents such as Luke ‘Ming’ Flanagan in Midlands-North-West, anti-debt campaigner Diarmuid O’Flynn in Ireland South and sitting socialist MEP Paul Murphy in Dublin. However, a controversy has erupted over the manner in which the state broadcaster RTE showed bias against independents and left-wing groups after the Broadcasting Authority of Ireland (BAI) upheld a complaint from two small left-wing parties. The BAI said RTE had ‘unfairly’ avoided reporting poll results which showed a surge in support for independents and small left-wing groups. RTE had acted “in a disgraceful way” throughout this campaign, said Brid Smith of the People Before Profit alliance. She and Socialist Party MEP Paul Murphy were vindicated n their complaint that RTE had suppressed news of a dramatic rise in support for both our candidacies. “We believe that this arises from a systemic bias which assumes that non-mainstream parties must be marginalised and not treated seriously,” she said. Meanwhile, the main newspapers in the 26 Counties have continued to attack Sinn Fein. The largest newspaper in the State, the Irish Independent, has published a series of articles critical of Sinn Fein and its party leader, Gerry Adams. This week Mr Adams sought to halt the publication of an opinion poll about his alleged involvement in the 1972 IRA killing of Jean McConville, for which he was questioned by police and released without charge earlier this month. On Saturday the Irish Independent carried the results of a survey, which showed that nearly half of voters in the 26 Counties believe the Sinn Fein leader had a role in the mother-of-10’s disappearance in 1972. The Irish Times also published a poll which found that 68 per cent of people in the south believed Mr Adams had been in the IRA. However, both newspapers have also published polls which show that the Sinn Fein leader remains the most popular politician in the 26 Counties. 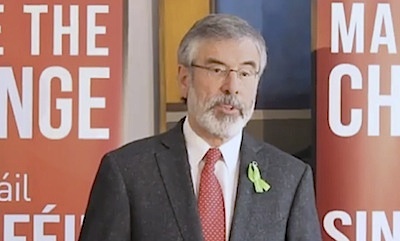 In his final pre-election comments, Mr Adams called upon the Irish public to “make the change from the failed politics of old” by voting for Sinn Fein. “Recent times have exposed serious failings in many of the institutions of Irish life,” he said. “The old way of doing politics has failed. Citizens are still being forced to pay for the actions of corrupt bankers, developers and politicians. “This is deeply unfair. Banking debt, unemployment, forced emigration, a raft of new taxes, including water taxes and the property tax and cuts to public services are crushing the hope of citizens. Two by-elections to the Dublin parliament are also taking place tomorrow [Friday] in Longford-Westmeath and Dublin West respectively. Polling opened at 7am on Thursday in the Six Counties and runs until 10pm. Votes cast in the council elections will be counted and declared on Friday and Saturday. However, the results of the European vote will not revealed until all 28 countries have voted and a central count is completed on Monday. In the 26 Counties, voting begins on Friday at 8am and continues until 10.30pm. The ballot boxes will be opened in count centres on Saturday, with results from the local and by-elections to be completed first. Full results from all of the election counts will be published here as they become available.